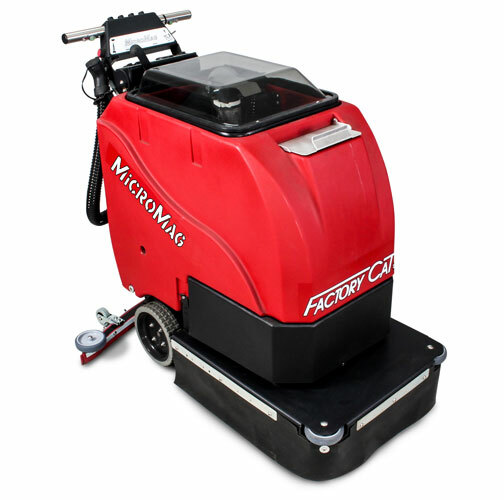 The Factory Cat Micro Mag Walk-Behind Floor Scrubber is the smallest of the Factory Cat walk-behind fleet with a cleaning width of up to 20″. This machine is modeled after the MiniMag and Magnum machines, but designed a little smaller for accessibility into those tighter areas. This machine is available in a Brush-assist drive, or a Traction-drive that offers a smooth performance even on those uneven surfaces. Call us today to schedule a FREE DEMONSTRATION! 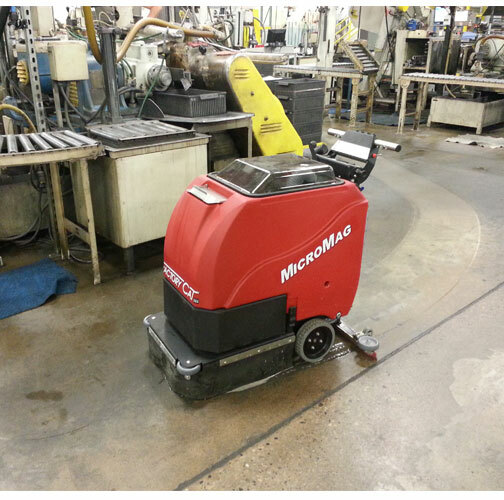 The Factory Cat Micro Mag Walk-Behind Floor Scrubber is the smallest of the Factory Cat walk-behind fleet. Designed after the earlier models Magnum and Mini Mag, the Micro Mag is designed to squeeze into small places; without losing productivity or solution space. The Micro Mag is available with a traction drive option, to give the operator complete ease when maneuvering (especially up ramps). However, brush-assist drive also creates easy maneuverability but with a fraction more effort. The brush-assist drive if perfect for facilities with level floors and is cheaper than the traction drive option. The Factory Cat Micro Mag is available in either cylindrical or disk brush head. The cylindrical is great for sweeping up minor debris and dust, eliminating clean up time. However, the disk machine has about 50% more power. With this power, the disk machine can be equiped with special pads for stone polishing. To learn more about stone polishing, click HERE. Rear Wheels (2) 8" x 3"
Front Casters: (2) 2.5" x 1.38"
Size (L x W x H): 40" x 18" x 38"
Weight (w/o batteries): 152 lbs. Disk Brush/ Pad Size: 17-D: (1) 17"
Brush Down Pressure: 0-125 lbs.